Young Boston terrier was suffering with respiratory distress due to chest infection. Patient is a 14 week old, male, Boston Terrier referred for thoracic CT due to ongoing pyothorax. Chemistry- hypocalcemia and hypoglobulinemia. The ALT (391) was mildly elevated. Full body radiographs- pleural effusion, interstitial pulmonary changes. Cytology from thoracic fluid- many degenerative neutrophils with intracellular cocci. Prior to anesthesia, 25 mls were drained via the chest tubes since free fluid decreases the diagnostic yield of CT scans (similar to X-rays). Afterwards, the patient was premedicated with midazolam, induced with propofol, intubated and maintained on sevoflurane using a 5 cm peep valve as per our anesthesia consultant recommendations. A CT scan of the thorax was performed (pre-contrast). Afterwards, Omnipaque™ (iohexol, contrast agent) was administered IV and a post-contrast scan was performed. 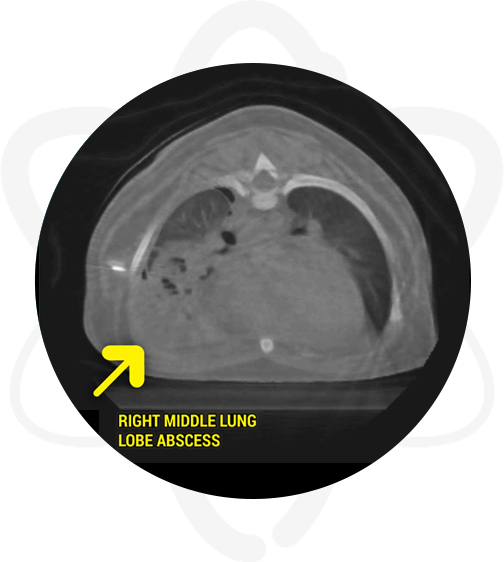 Right middle lung lobe abscess causing the reported pyothorax. Right pneumothorax. No evidence of thoracic wall trauma or foreign body. Suspect left chest tube causing trauma to the left lung w/o evidence of left side pneumothorax. Patient had thoracotomy and right middle lung lobectomy the following day. How CT Helped in This Case? CT allowed to stage and localize the disease. 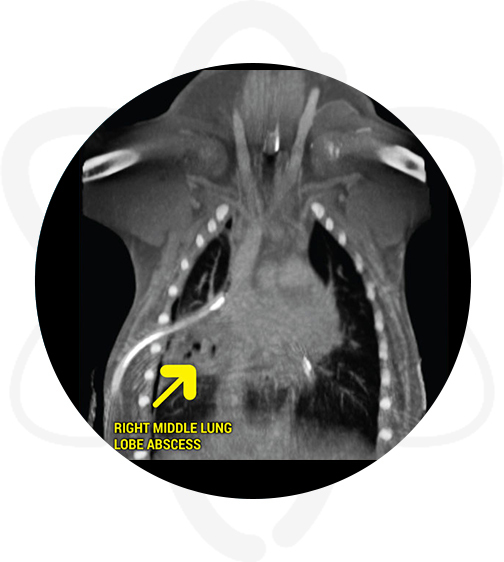 CT provided vital information for surgical planning; it allowed the surgeon to perform a right thoracotomy instead of a sternotomy. The morbidity with a right thoracotomy is much less than with a sternotomy.